Seconds later, I managed to squirt super glue straight across the fingers of my left hand. I didn't panic (well, maybe for a second). Thankfully, I managed to get my wedding ring off before it fully adhered to my hand and kept my fingers apart as I ran to the sink. As you can see from the picture, the ring is not in great shape at the moment. For that matter, neither is my hand. I spent the rest of the evening, trying to scrub the glue off my hand. White spirits, nail polish remover, salt. None of them really worked. Instead, I am slowly picking off little flakes whenever I can manage it. However, my fingers still scrape together as I type. Save the Children - The Campaign Continues! It has been three weeks since I launched my first campaign for The Order of the Sword and Dice, a quest to raise £500 for Save the Children to help their efforts in the ongoing refugee crisis in Europe. My first effort was to write a special charity Frostgrave scenario and ask those playing it, or downloading it, to please donate to the effort. Thanks to the generosity of a few good souls, a few named, most anonymous, I have so far raised £205! For those just finding about this, you can see the charity scenario here and donate here. So, my quest is off to a good start, but I still have a long way to go. It appears that my first effort is not going to be enough to reach my goal. I'm currently pondering other ways in which I can try and help out. I am thinking about having a miniatures sale. A chance for me to get rid of a few miniatures that I either never use or am never going to paint, and hopefully raise some cash for the quest as well. I'll be back with more on this soon! 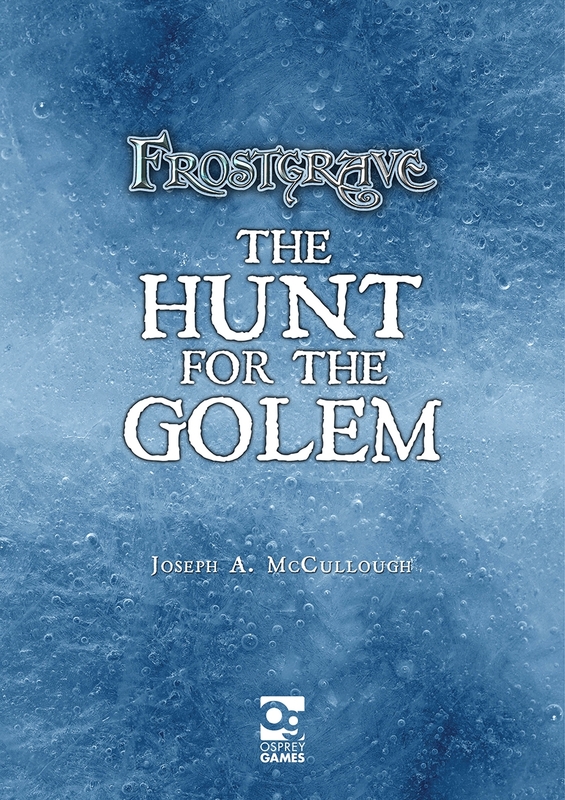 The Hunt for the Golem is a PDF mini-campaign for Frostgrave. It features three new scenarios, a unique monster, and a few new treasures. It will probably be especially interesting to Enchanters and other construct lovers. I originally wrote it as a part of the Frostgrave 'Nickstarter' pre-order campaign. Now, Osprey have put it up for sale so that everyone who wants can get a copy. It is currently available as a PDF on Wargames Vault. It's a US company, but I'm pretty sure it will sell to anyone anywhere. It will also be for sale on the Osprey website soon. A kindle release is also planned, but I'm not sure of the time scale on that. So, if it sounds like something you might like, head over to Wargames Vault! I have purchased several ebooks through Wargames Vault in the past and always found them a top-notch company. The above quote is generally attributed to the Irish philosopher Edmund Burke, although there is no direct evidence that he ever actually said it. Regardless, it is a hugely powerful line, and one that has followed me my whole life. I was raised on the tales of fantastical heroes like Gawain, Aragorn, and Spider-Man. Heroes who fought against evil monsters to save lives, free the oppressed and protect the powerless. It was my childhood desire to be a hero like them that first drove me into fantasy gaming, first as a role-player and later as a wargamer. I wanted to be the hero that smashed down the walls of the tyrant's castle and freed the captive people. In fact, even today, when I play an occasional solo wargame, it usually includes a clear good vs. evil set-up, and I have even been known to cheat a little to ensure that the good guys win. As I've gotten older, wiser, and more self-aware, it has become clear to me that I will probably never be on the front line of the fight against evil. I don't posses that kind of strength or courage. Yet, the quote stays with me. A few years ago, I had an idea to found my own knightly order, The Order of the Sword and Dice. It would be a collection of wargamers, role-players, and other dice-flingers, who felt like I did, who wanted to change the world for the better but weren't quite sure how. Together, I thought, we could raise money for organizations that really are on the front-lines tackling problems like refugees, human-trafficking, and disaster relief. I even got as far as getting my friend, the noted historical artist, Peter Dennis to paint up a heraldry for the order, which can be seen above. As I was getting it all organized, I shared the idea with a few people. Some were supportive, but a few others thought the idea was 'silly' or even 'dangerous'. Sadly, these comments were enough to dishearten me, and I ended up putting the whole thing away. In fact, I was convinced to do nothing. Well a few more years have passed, and my world has changed. The birth of my daughter has caused a huge shift in how I perceive life and the things that I value. I have come to realize that even if it is silly, The Order of the Sword and Dice is important to me. It is there as a reminder to do something, to try and be the good man I want to be. If it is dangerous, it is only dangerous in the way that any call to action can have unpredictable results. Thanks to the publication of Frostgrave, I currently have a bit of a 'voice' in the gaming community. That may or may not last, but while it exists, I would like to try to use it to do some good. And so, today, I am officially founding The Order of the Sword and Dice. Later today, I will start its first campaign, a campaign to raise £500 for Save the Children to aid their work during the current Syrian refugee crisis. To start the campaign, I will be posting up a new Frostgrave scenario on my blog. I will ask that anyone who plays the scenario, prints it out, or otherwise adds it to their collection of Frostgrave material, to please kindly donate at least £1 to Save the Children through a MyDonate page that I have set up. If you join in this campaign, you can consider yourself a member of The Order of the Sword and Dice, or not, as you choose. Either way, I hope you will help out, and maybe we can all be heroes, at least in some small way. The biggest news in the wargaming world over the last year has been the release of Warhamer: Age of Sigmar, or the destruction of the Warhammer Old World, depending on your personal feelings about it all. I actually don't have any strong feelings about it. I liked the Old World well enough, but I didn't play the game and only rarely bought any of the figures. I think it is clear that Games Workshop had to do something in order to preserve fantasy as a core part of their business, and so they went with a bold new redesign. I haven't read the Age of Sigmar rules or played a game, so I can't really comment on it. However, I am a big fan of some of the terrain kits that they have put out for it. 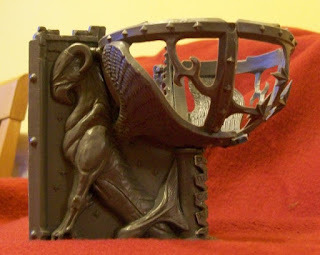 I think they are some of the coolest, most interesting fantasy terrain pieces I have seen in a long time. Some of them, dare I say it, would look really good in a game of Frostgrave. 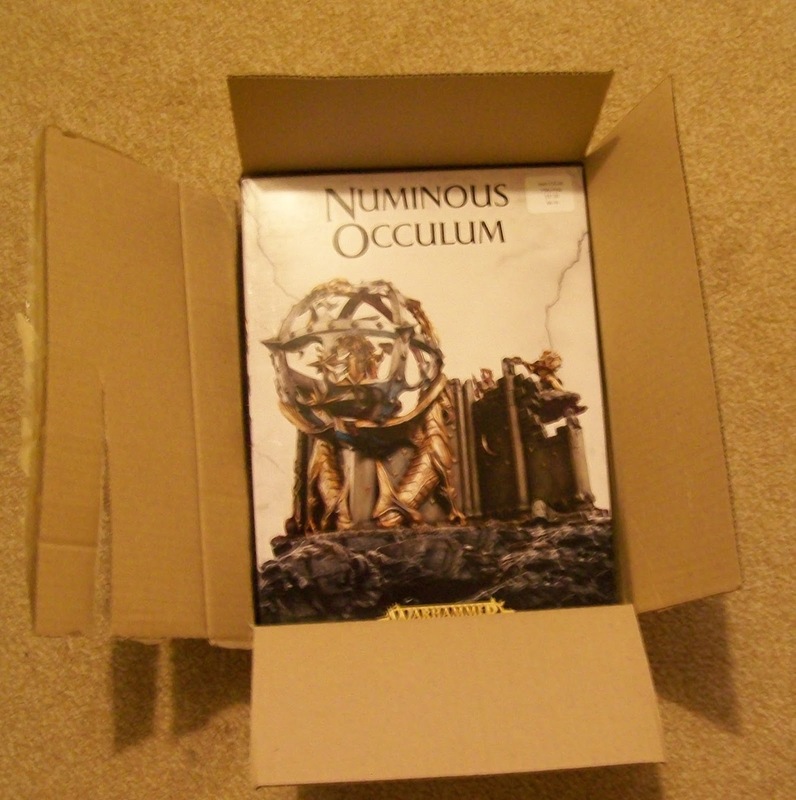 In fact, I have been so struck by the terrain that I recently ordered my favourite, the Numinous Occulum (great name). I ordered from Firestorm Games as they had a competitive price, and they have been a good supporter of Frostgrave. My order came quickly and well packed. The kit comes with four sprues of pieces, all of which are cast in heavy plastic. I have no doubt they will easily withstand the rigours of the gaming table. I started assembly while watching the new Godzilla movie. Assembly required a lot of clipping, cutting and filing. I've probably put in about an hour's work all told, and I would guess I'm a bit less than halfway done. That said, it is look pretty cool so far. What the picture here doesn't related is just how big a piece it is. I suppose it is designed for the new, extra-large Age of Sigmar figures, which means for standard 28mm figures, it is a big piece of terrain. I'll try to get a shot with a figure in it next time for scale purposes. So far, I'm really pleased with the kit and look forward to getting some more work on it. I might even have to write some Frostgrave rules for playing with such a terrain piece. Of the four principle hobbits in The Lord of the Rings, two carry the One Ring - Frodo, who carries it all the way to Mount Doom, and Sam who takes it off Frodo when he thinks he has been killed and who returns it when he realizes his mistake. The other two hobbits are never directly tempted by the ring. I think, however, it is safe to assume that Pippin could not have handled it. He couldn't even resist the temptation posed by the Palantir. Which leaves just Merry. It's hard to say how Merry would have handled the One Ring, had he been forced to carry it. He was certainly brave in battle, but that is no measure of resistance to the Ring (see Boromir). So, we are left to our own thoughts on the subject. Personally, I believe Merry could have carried the ring, and, while I think he would have found it more difficult and more tempting that either Frodo or Sam, with support, he could have made it. Feel free to disagree. All of this is just a long-winded introduction to show off the two miniatures I have managed to paint lately. The first is Merry in his Rohan equipment as produced by Games Workshop as part of their The Lord of the Rings line. A very nice little figure and fun to paint. 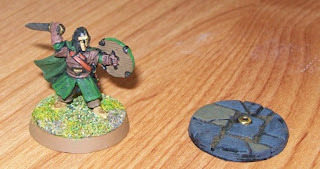 Strangely, as far as I know, GW never produced a figure for the One Ring itself, at least not all on a base of its own. It seems a bit of an oversight somehow. My One Ring is one of the Frostgrave treasure tokens that were originally made as giveaways during the Nickstarter, but are now generally available. It's not a huge painting output, but it's not bad considering the time I've had lately. It is funny how even a little bit of quiet hobby time, and a little bit of progress on some miniatures really improves my general outlook.